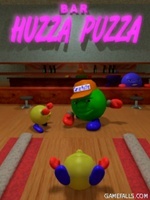 Huzza Puzza - is the mobile interpretation of the favorite Collapse game. The purpose is to clear the board from the color balls and get a high score. Click the combination of three or more balls of the same color with your stylus and it will disappear. The more balls are in this combination the more scores you get. There are some bonuses - bombs that explode neighboring balls. There are three game modes: Puzzle, Puzzle Random and Logic. The aim of the game is to collect the composition of the tubes at the board in the limited time (the sample of the composition can be seen at the top left corner small board). To move the figure you should click at it with the stylus, to choose the direction – use the arrows or the cursory buttons. The figure moves till the encounter with the border or another figure! Game download and trial period are free! Have a nice game!